Bermudian veterinarian Dr. Stephanie Wilkinson specializes in the treatment of horses and has recently established the local veterinary practice, Island Equine Veterinary Services Ltd, which sees her visit the island every few weeks to lend her considerable expertise to the local equine community. Dr. Wilkinson currently practices veterinary medicine in Virginia and travels between the two locations providing the local equine community the benefit of having regular access to current industry standards in equine medical care. 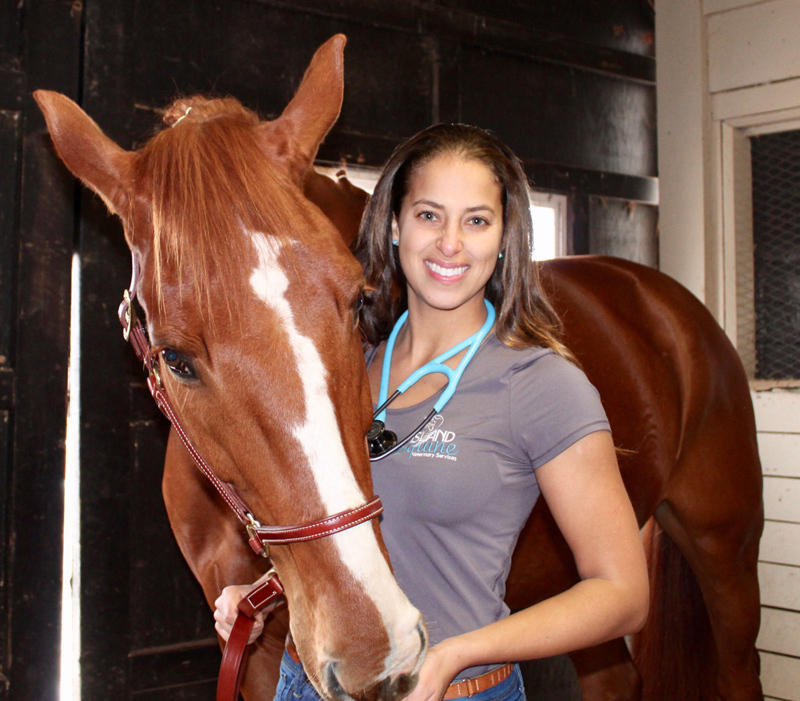 The Bermudian veterinarian, who began competing as an equestrian at the tender age of six years old, always knew what she wanted to become when she grew up: an equine veterinarian. Not only did she achieve her goal but she did so with a laser focus, obtaining her Doctor of Veterinary Medicine degree from Ontario Veterinary College, University of Guelph, Ontario, at the top of the entire graduating cohort of 2016. In addition to her Doctorate, five special awards were conferred upon her including awards for: highest academic and clinical proficiency in surgery, highest standing in courses relating to equine contagious diseases, most proficient in large animal medicine and surgery in Large animal clinic rotation. She was also awarded the Andrew Smith Memorial Gold Medal, the highest honour conferred upon a graduate by the institution, given for exemplary scholastic ability, proficiency in clinical fields and awarded to the student with the highest program average throughout her entire college career. Dr. Wilkinson currently practices veterinary medicine at The Piedmont Equine Practice, Inc., a highly-regarded veterinary practice located in Virginia. She also performs general anesthesia for emergency surgical cases within the practice. She even had the unique opportunity to work with the Smithsonian Conservation Biology Institute for an emergency surgery on a vulnerable species of zebra. Dr. Wilkinson was recently able to fulfill another childhood dream, as Island Equine Veterinary Services Ltd. — her recently established local veterinary practice – is the vehicle through which she provides high quality veterinary services to the local equine community. “It made perfect sense for me to start a practice in Bermuda, even though I am practicing full-time in Virginia. With Piedmont I am required to be fully proficient and current in the latest medical techniques and procedures; and to be knowledgeable in the appropriate administering of all medications. The demand for Dr. Wilkinson’s services has steadily grown with each visit to the Island as clients see the benefits of the services she provides. The former Warwick Academy student, who during her four years of post-secondary undergraduate studies and four years of postgraduate studies, was also the recipient of the Bank of Bermuda Foundation Sir John W. Cox Scholarship, the Oil Group Scholarship and the Nicholl Scholarship, believes that the key to finding career fulfillment is to “pursue your passion and find a way to make it practical” – in other words, work to ensure your passion puts food on the table. Dr. Wilkinson can be reached at srwilkinson@island-equine.com. Here is an eminently qualified young Bermudian who is excelling overseas and is bringing her skills home, at least part time, great job. Good for you my dear. You had a dream and now it is your passion. A wonderful, bright and compassionate person. So proud of you Stephanie. You followed your dream and made it…..wow. An inspiration to all of us. All the best to you as you have applied your wonderful work ethic to all you do. Bermuda is blessed to have you.